Sewer inspection robot. Kurt I, a sewer inspection robot prototype. 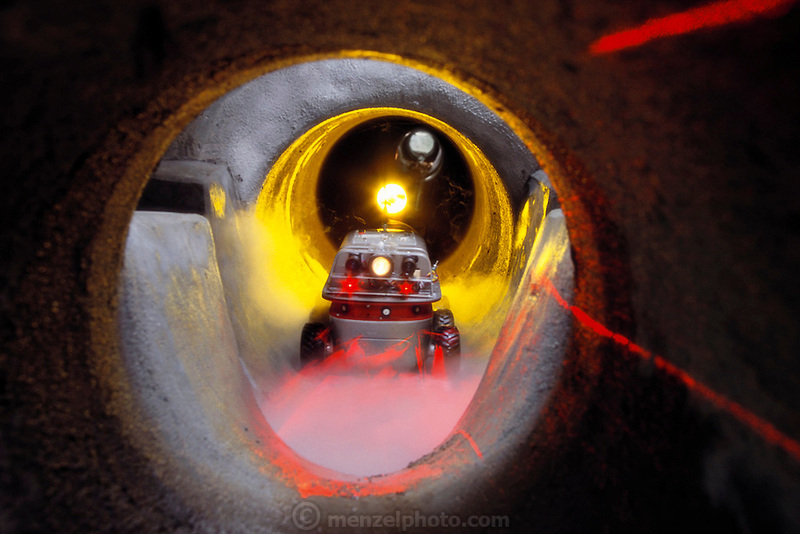 Here, the robot is moving through a simulated sewer at a German government-owned research and development centre. Unlike its predecessors, the Kurt I, and its successor, Kurt II, are cable-less, autonomous robots, which have their own power supply and piloting system. Kurt uses two low-powered lasers (upper centre) to beam a grid (red, lower centre) into its path. When the gridlines curve, indicating a bend or intersection in the pipe, the robot matches the curves against a digital map in its computer. It will then pilot itself to its destination. Photographed in Bonn, Germany.